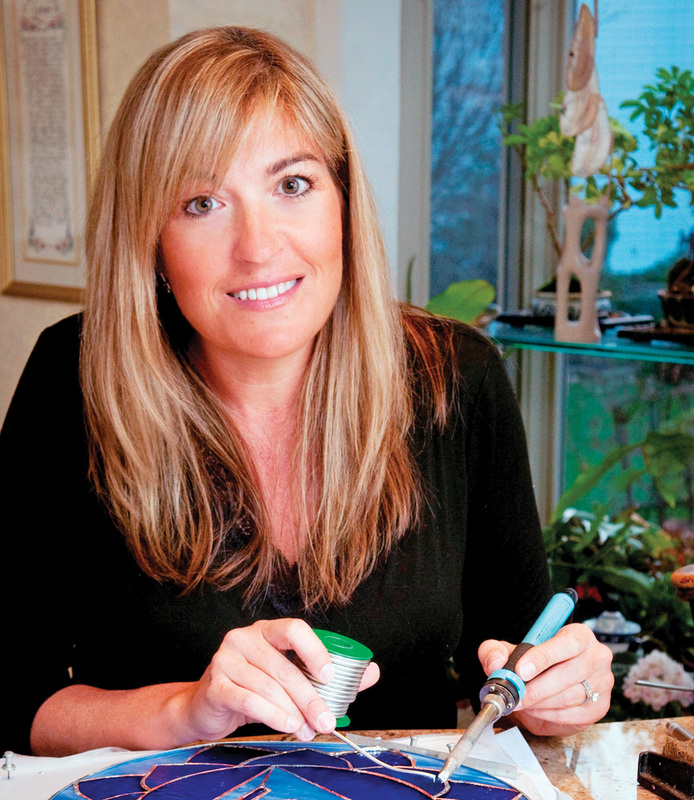 Ellen Rice Gallery stained-glass artist Chiara Reading will share her techniques during a special exhibit of her sea-themed stained glass creations at the Ocean View gallery on Wednesday, July 11, from 10 a.m. to 6 p.m. The public is being invited to meet Reading, explore her works of art and have the opportunity to purchase from a variety of her creations from 10 a.m. to noon and 1-6 p.m. Light refreshments will be served in the morning and early afternoon, with the addition of wine and cheese from 3 to 6 p.m.
Reading said she discovered her passion for designing stained glass in 2009, during a class she and her husband took as part of a date-night they do every month or so to try out new things. “I didn’t know I had an artistic bone in my body until I was 40 years old,” she said, “but the first time I scored a piece of glass and it broke the way I wanted it to, something clicked and I was hooked. Her nautical theme started with another passion shared with her husband: scuba diving. Mermaids and mermen, seahorses, paua and nautilus shells all find their way into her creations. She’ll have a wide variety of pieces, large and small, on display and for sale on July 11. Reading is one of more than 100 local and regional artisans represented by local, internationally collected painter Ellen Rice in her award-winning Ocean View gallery. Some will recognize her “Nature’s Glory” work from its representation by the former Artful Bean in Bethany Beach. The Ellen Rice Gallery, founded in 1999, is located 2.2 miles west of Bethany Beach’s wooden totem at 111 Atlantic Avenue (Route 26) in Ocean View, on the north side of the road, across from Lord Baltimore Elementary School in Coastal Plaza. Visitors can look for the gallery’s yellow butterfly benches, bright red shutters and follow the yellow flower pots to the front porch entrance.